The Sacred Healing Salve for Mental Clarity comes from an ancient recipe whose sacred secret combination of natural ingredients is energetically transformed during a series of 7 ancient ceremonies. This salve contains Unity Consciousness Healing Unconditional Love Energies that synchronize normal communications between both sides of one’s brain and super normal communications between one’s 3D brain and one’s 4D Mind or Soul. 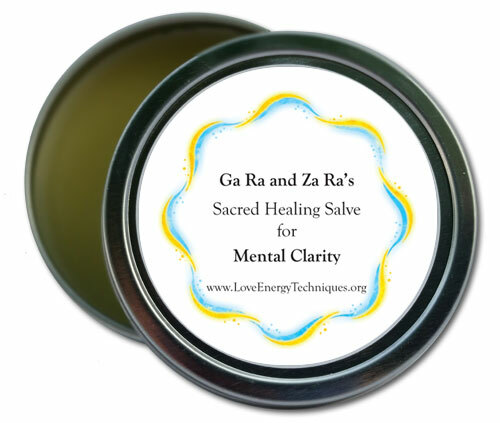 Rubbing Mental Clarity Salve on the right and left “temples” of one’s head infuses Unity Consciousness Healing Unconditional Love Energies directly into the right and left sides of one’s brain. Then, by rubbing some Mental Clarity Salve on one’s 3rd Eye Spiritual Energy Center while repeating ancient Love Energized mantras, one connects the 3D energies of one’s brain to the 4D energies of one’s Mind for the clarity of thinking associated with the state of Conscious Awareness called Enlightenment, so that people suffering from stress, fear and lack of mental clarity or confused thinking may obtain healing help and relief from pain.